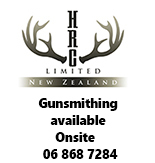 New Zealands Quality supplier of Firearms, Ammunition, Hunting and Reloading Gear. Locally owned and operated we sell a full range of Firearms (Rifles,Shotguns, Air Rifles), Ammunition and Accessories to meet our customers specific requirements. We aim to provide the Hunter or Sports Shooter with quality hunting and shooting gear at excellent and affordable prices. Our gun services include general gunsmithing and repair, milspec coatings for rifle components, rifle rebarreling, action bedding and barrel floating, custom built firearms (hunting, target and tactical rifles), gun suppressors supplied and fitted, custom ammunition reloads and development, reloading classes, riflescope sighting in and gun cleaning services. If a product is not listed on our website please feel free to contact us to check on the availabilty of the product and offer a quote. As we have a physical Gun Shop based in Gisborne on the East Coast of NZ we are able to source a wide range of hunting goods which may not be available to us if we were only operating an online store. Call in for free advice or alternatively please call us on 06 868 7284 to discuss your specific requirements.